As the weather gets colder and the fall creeps through, you will start to encounter changes in your lawn and landscaping. One of these major changes may come in the form of driveway issues that will require maintenance. When the temperature drops and the weather gets wetter, your driveway may be cracking or otherwise looking worse for wear. There are some measures you can take this fall to make sure your driveway is looking its best year-round, that will also help promote the health and beauty of your landscaping. Here are some tips on what to look out for when caring for your asphalt this fall. Identifying drainage issues with your driveway will not only help you identify the root cause of repeated cracking and bumping in your asphalt surfaces, but it can help you combat soil erosion in your lawn. Many people find that they have drainage issues around their driveways, which can cause problems for the long-term maintenance of your asphalt but also cause issues for your home. Avoid flooding and erosion that impact your home and lawn by identifying drainage issues when they will be most apparent this fall. This can help cut down on the amount of black ice that forms in your driveway this winter and also promotes the health of your groundwater. Cracks in your asphalt surfaces can become dangerous to you, your family, guests, and even passersby. It’s important to address cracks now before they get worse in the winter when expanding ice and frigid cold will only help the issue grow. 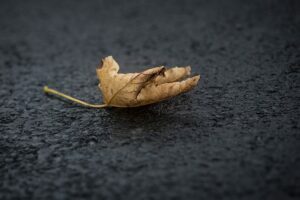 Staying on top of smaller issues like cracks in the fall will help you keep the maintenance level of your hardscaping and paving low year-round. When filling the cracks in your asphalt driveway, it’s also useful to examine the damage. Cracks can be caused by any number of things, and addressing these can help prevent dangerous cracking in the future. Some of the major causes of driveway cracking are rooting plants that grow beneath the driveway, freezing rainwater, and sharp objects like the lawn mower repeatedly driving over the surface. Another way to extend the usable life of your asphalt driveway is through sealcoating. By applying this protective coating to your asphalt surface, you can fill cracks while totally renewing your driveway surface. A great way to keep your asphalt well-maintained that many professional landscapers recommend is to pair crack filling with a layer of sealcoating. Using both methods this fall can help keep your driveway looking new all year long. This entry was posted on Friday, November 9th, 2018	at 9:49 pm	and is filed under Asphalt	. You can follow any responses to this entry through the RSS 2.0	feed. Both comments and pings are currently closed.